When talking about lips I think we've failed to acknowledge the best lip color of all, the sequin. Perhaps one of my favorite designers is Markus Lupfer, and while I can't afford any of his fabulous clothing, I can definitely rock the imitations. It still blows my mind that I'm occasionally asked to pick out items I'd like to style from various sites. 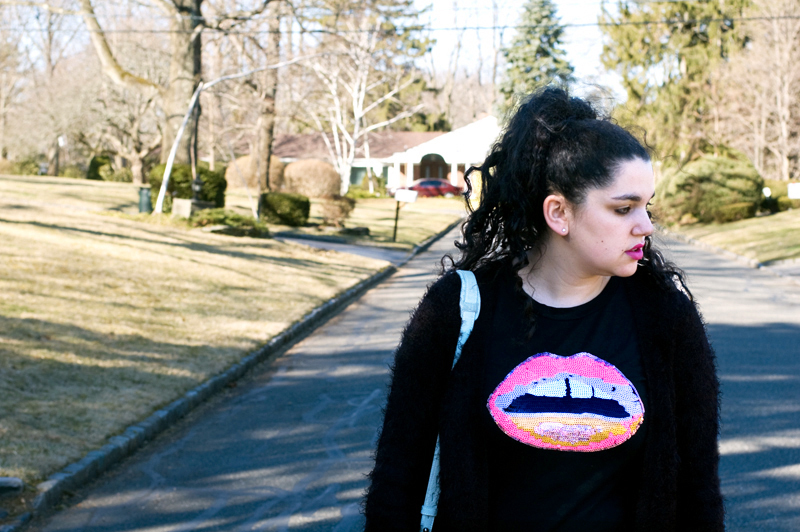 I had been eyeing this lip tee for quite some time and was very excited to receive it in the mail on Friday. It's even better than I imagined. I'm a huge fan of graphic tees and this one was the perfect addition to my collection. Not to mention, the sequin lips match my Girl About Town lipstick. Photographs taken by the BF. uh-azing. love that sweater and it's so you! also loving your high pony ... you should def. wear it like that more often! Just love this amazing top! the sequin lips are so much fun and i love how you styled it with a cozy, laidback look. also, love your curly pony in this post!